We will present photosynthesis in two parts: this page will discuss the reactions that convert light energy to chemical energy in the form of ATP and reduced electron carriers (NADH or NADPH). Both are needed for carbon fixation reactions (the reduction of inorganic carbon to make organic carbon molecules) presented in the next page. An important by-product of the light reactions is the generation of oxygen gas. In the chemical equation above, the oxygen atoms in water are bolded in red to show that these are the source of the oxygen atoms in oxygen gas. Oxygenic photosynthesis evolved to take electrons from water to make oxygen gas, and ultimately give the electrons to carbon dioxide to form organic (reduced) carbon molecules (food) – the exact reverse of aerobic respiration, which takes electrons from organic carbon molecules and ultimately gives them to oxygen gas to make water. There are two different general components of phothosynthesis: the light reactions and the Calvin cycle. The light reactions require light (photons) and water as inputs, and they make ATP, NADH or NADPH, and oxygen. Oxygen is a waste product, but ATP and NADH/NADPH are essential for the next step, the Calvin cycle. The Calvin cycle is what actually fixes carbon (makes sugar), using the products of the light reactions (ATP, NADH/NADPH) and carbon dioxide. The product of the Calvin cycle is fixed carbon, or sugar. In this section, we will focus on part one, the light reactions (require light; make ATP, NADH/NADPH, and oxygen). We will discuss part two, the Calvin cycle (requires products of the light reactions in terms of ATP and NADH/NADPH, to produce sugar from carbon dioxide), on the next page. Visible light is a slice of the electromagnetic (EM) spectrum, from about 400 nm to a little over 700 nm in wavelength. where h is Planck’s constant, c is the speed of light, and lambda is the wavelength. Therefore, photons of shorter wavelengths (blue-violet) have more energy than photons of longer wavelengths (red). Phototrophic organisms convert light energy into chemical energy in the form of ATP. The use of light energy to make ATP is called photophosphorylation. Photophosphorylation is similar to oxidative phophorylation in that both use a proton gradient across a membrane to power similar ATP synthase enzyme complexes. Photosynthetic organisms (photoautotrophs) use light energy to make both ATP and reduced electron carriers (NADH or NADPH). The reduction of carbon dioxide (CO2) to carbohydrate (CH2O) requires both ATP and reducing power in the form of NADPH or NADH (NADP+ is NAD+ with a phosphate group added, and is used by chloroplasts instead of NAD+). The earliest phototrophs and photosynthetic organisms were prokaryotes with single photosystems that did not generate oxygen. Two different types of photosystems evolved, that were combined in cyanobacteria. One of the two photosystems in cyanobacteria evolved the power to oxidize water molecules as a source of electrons, releasing O2. No Archaea thus found are truly photosynthetic. Halobacterium, which is an Archaeal species despite its name, uses bacteriorhodopsin, a purple-colored membrane protein, as a light-driven proton pump to generate a proton gradient across the plasma membrane and power chemiosmotic ATP synthesis. Thus Halobacteria are phototrophic, but not photosynthetic, because they do not use light energy to fix carbon dioxide to organic carbon. Phototrophic organisms still depend on organic food molecules to build their own biomass. Photosynthetic bacteria and chloroplasts all use variants of chlorophyll. Chlorophylls absorb blue and red light. Photosystems are membrane complexes of proteins and chlorophyll molecules. The chlorophyll molecules absorb photons and funnel the energy to a reaction center chlorophyll, which becomes oxidized (loses electrons). All oxygenic photosynthesizers (those that produce oxygen gas as a byproduct; cyanobacteria and chloroplasts) have two different types of photosystems coupled together. In contrast, all anoxygenic (do not produce oxygen gas) photosynthetic bacteria have just one type of photosystem. The earliest phototrophs were probably anoxygenic. Photosystem I, when it becomes oxidized by absorbing light energy, transfers electrons to a protein called ferredoxin, which in turn reduces NADP+ to NADPH. NADP+ is an electron carrier, a phosphorylated form of NAD+; it may help to think of the P as standing for photosynthesis. Photosystem II, upon absorbing light energy, transfers electrons to a membrane-localized electron transport chain, that pumps protons to generate an electrochemical gradient for chemiosmotic ATP synthesis. In cyanobacteria and chloroplasts, oxidized photosystem II splits (oxidizes) water molecules to regain electrons, and thereby generates oxygen gas. Figure 2 from Blankenship 2010. Electron transport diagram indicating the types or RCs and electron transport pathways found in different groups of photosynthetic organisms. The color coding is the same as for Figure 1 and highlights the electron acceptor portion of the RC. Figure courtesy of Martin Hohmann-Marriott. How did such a complicated system with two different photosystems evolve? Clues come from the observation that some phototrophic and photosynthetic bacteria have only one photosystem. And they have either a type I or a type II photosystem. Phototrophic bacteria that have only a type II photosystem (PSII), such as the purple bacteria, use light energy to make ATP by photophosphorylation. Photophosphorylation is very much like oxidative phosphorylation. In both, a membrane-localized ATP synthase complex uses power from a proton gradient to make ATP. Light energy oxidizes the reaction center chlorophyll and transfers electrons to an electron transport chain, which generates a proton gradient across the photosynthetic membrane. The terminal electron acceptors in purple bacteria are the oxidized reaction center chlorophylls; the electrons flow in a cycle from PSII down the ETC back to PSII. Purple sulfur bacteria with only PSII cannot use light energy to make NADH or NADPH, and use other pathways to oxidize hydrogen sulfide as a source of electrons to make reduced electron carriers [correction of earlier version that said these bacteria cannot fix CO2]. Bacteria with only a type I photosystem (PSI), such as green-sulfur bacteria, can be true photoautotrophs. Light energy oxidizes the reaction center chlorophyll, which reduces the the electron carrier NAD+ to make NADH. The oxidized reaction center chlorophyll must then be reduced by electrons from a chemical electron donor, such as hydrogen sulfide (H2S). The oxidized reaction center chlorophyll pulls electrons from H2S down the photosynthetic electron transport chain, which generates a proton gradient to make ATP. Thus green-sulfur bacteria use light energy to produce both ATP and reducing power; both are required for carbon fixation (reduction of CO2 to carbohydrate). However, they are limited by the availability of a suitable electron donor such as H2S. Approximately 2.5-2.7 billion years ago, cyanobacteria evolved a scheme that coupled both types of photosystems. In the non-cyclic electron flow scheme (often called the Z-scheme), light-activated PSII gives its electrons to the electron transport chain to drive photophosphorylation. Simultaneously, light-activated PSI gives its electrons to reduce NADP+ to NADPH. The two systems are linked because the oxidized PSI is reduced by the electron transport chain (an electron is transferred from the ETC to PSI). Oxidized PSII regains electrons from oxidizing water molecules to generate oxygen gas. Therefore, in cyanobacteria (and choroplasts), the flow of electrons is from water to PSII, then down the electron transport chain to PSI, and finally to NADP+ to make NADPH (cyanobacteria and chloroplasts use NADP+/NADPH instead of NAD+/NADH). The ability of cyanobacteria to extract electrons from water gave them a huge evolutionary advantage over green-sulfur bacteria, which were restricted to locations that had hydrogen sulfide or other suitable electron donors. Photosynthesis in chloroplasts is essentially the same as photosynthesis in cyanobacteria. Both use non-cyclic electron flow to produce ATP and NADPH and O2. The figure below illustrates non-cyclic electron flow during photosynthesis in chloroplasts. 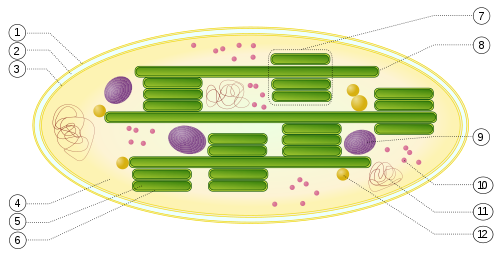 Non-cyclic electron flow on the chloroplast thylakoid membrane. PQ, cytochrome, and PC are all components of the photosynthetic electron transport chain (ETC); students need only to recall that electrons flow from water (releasing O2) to PSII, down the ETC to PSI, and end at NADP+ to make NADPH. The ETC pump protons across the membrane to generate a H+ gradient. The chloroplast ATP synthase uses the energy stored in the H+ gradient to make ATP, just like the mitochondrial ATP synthase. When metabolic demands in the chloroplast require additional ATP, but no additional NADPH, cyclic electron flow from PSI through the electron transport chain and back to PSI can boost the proton gradient and thus photophosphorylation (light-driven ATP synthesis). Thus PSI is versatile in the sense that oxidized PSI can give electrons to either NADP+ (most of the time) or to the ETC (when needed to make additional ATP). The membranes of photosynthetic bacteria are highly convoluted via infolding of the plasma membrane, multiplying the surface area for light absorption and photosynthesis. These infolded membranes are also present in chloroplasts, which evolved from endosymbiotic cyanobacteria. These infolded membranes are called thylakoids, and the lumen of the thylakoid corresponds to the extracellular or periplasmic space of the cyanobacteria. This 5-min video gives a very nice animation of the light reactions of photosynthesis – students in Biol 1510 do not need to remember the details of the electron transport chain nor the name of the enzyme that reduces NADP+ to NADPH. Written by: Jung Choi on October 23, 2012.on October 24, 2017. Hello professor, i think this sentence is confusing. Shouldn’t the First “reduce” in this sentence be “oxidize”? I see how that might be confusing. It should be reduce NAD+ or NADP+ to NADH or NADPH. I’ll make the correction, thanks. Is there a powerpoint attachment for this by any chance? I have a question. In the section beginning with “Bacteria with a type I photosystem”, NAD+ and NADH are mentioned. Is that an error, or do these bacteria use NAD+ instead of NADP+? Hello Professor Choi 🙂 , I have a question on Phototrophism vs. Photosynthesis. As I understood, phototrophic organisms generate ATP, but they do not reduce electron carriers such as NADP+, therfore there is no carbon fixation occuring. Is that can also mean that Archaea that mostly metabolizes its energy through phototrophism, is Photoheterotroph? Because phototrophic organisms cannot fix carbon but still use light to generate energy? But I don’t see what complex carbon molecules that Archaea break down. I refer flow chart from Wikipedia, and it classifies organisms into total four classes: photoautotrophs, heteroautotrophs, chemoautotrophs, and chemoheterotrophs. And I have trouble with where to put phototrophism in which class. Can you explain the difference between phototrophs and photosynthetic organisms? I’m still a little confused. Phototrophs use light energy to make ATP, but can’t do the carbon fixation part. Phototrophs still depend on organic carbon sources for their growth (make their lipids, carbohydrates, proteins, etc.). Photosynthesizers use light energy to fix carbon dioxide to make their own organic carbon. Woah! I never really looked at photosynthesis/respiration in the way that you revealed to me. In the first intro video here, you discussed how cyanobacteria developed the method of accepting electrons from water, producing molecular oxygen. This led me to recall that carbohydrates are simply a storage molecule, which allows organisms to more-efficiently allocate energy over time. However, then organisms evolved that were able to simply consume other organisms that already had a storage of carbohydrate, essentially stealing what the prey organism had worked hard for. This “stealing” or “consuming” process was even more efficient that the organism producing the storage molecule on its own, allowing for even greater organismal complexity. Humans, in fact, fall under this “stealing” category. Reordered the sections and figures on non-cyclic and cyclic electron flow, edited caption on non-cyclic electron flow diagram to highlight the overall scheme of non-cyclic electron flow through the two photosystems. Replaced the long (14-min) hand-drawn video with 5-min NDSU animation (also linked in my first comment at the top).